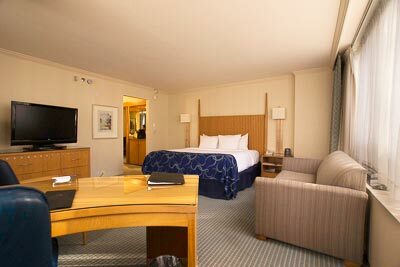 Located in the heart of downtown, The Marquette Hotel (612-333-4545, www.marquettehotel.com) makes a great home base for any Minneapolis visit. With restaurants and entertainment venues within easy walking distance, it’s easy to enjoy a relaxing car-free evening on the town. There’s plenty of accessible parking in the hotel garage, with a barrier-free path to the elevators. Valet service is also available at the accessible front entrance. From the elevator, there’s a ramp down to the front desk on the ground floor. There is also barrier-free access to the adjacent MARQ VII Lounge — a great place to unwind after a long day of sightseeing; and elevator access up to Basil’s restaurant, which overlooks the Crystal Court in the IDS Center. And of course, the staff is happy to do anything they can to make your stay more comfortable. 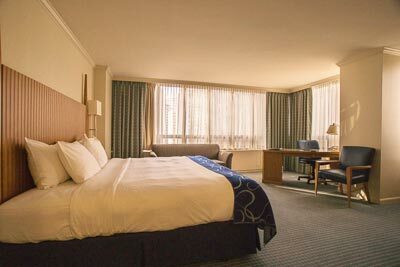 Room 1250 is a typical accessible guest room, with wide doorways and good pathway access. There is wheelchair-access to the 26-inch high king-sized bed, and plenty of room to wheel around the sofa, wet bar, large desk and chair that round out the furnishings. 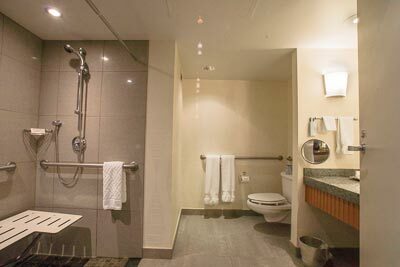 The bathroom is equipped with a roll-in shower with grab bars and a fold-down shower bench. The placement of the showerhead — within easy reach of the shower bench — is excellent. 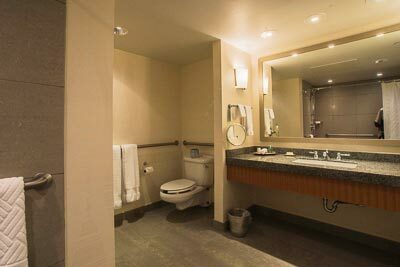 Toilet grab bars are located on the right and back walls (as seated), and the room also features a roll-under sink and a lowered make-up mirror. The latter item is often overlooked, and much appreciated. Best of all, the bathroom is very spacious, with a full five-foot turning radius. If you’re traveling with an attendant, there’s also an adjoining room available. And the view from this corner room is grand. You just can’t beat this property for access, location and ambiance.